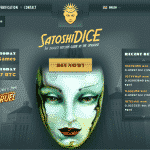 SatoshiDice is easily one of the most recognizable Bitcoin brands available to both casino and online gaming enthusiasts. Its name is inspired by the creator of Bitcoin, Satoshi Nakamoto and you can find it prominently attached or offered on many online gaming establishments currently supporting the online currency. Its appeal comes from the simplicity, convenience and security which are a trade mark for online transactions conducted with the Bitcoins cryptocurrency. The entire process is anonymous and doesn’t require any sort of personal details nor account creation. The idea is to pick one of the randomly listed addresses on the site and place a bet using your Bitcoin wallet. The intelligence behind SatoshiDice will then roll a random number which, if lower than the one you’ve picked, will reward you with a multiplier predetermined by the bet itself. The site for SatoshiDice was clearly designed with simplicity in mind – there is an absence of anything either flashy or animated. Rather, the emphasis is put on providing easily accessible information like betting rules and options, contact details, language support (up to 11 different languages are featured) and more. The central portion is dedicated to the bets themselves, with a clean and easily discernable table which states the bet address, name, win odds, prize and so on. The core of SatoshiDice is very simple – a bet is placed by sending a predetermined amount of Bitcoins to one of the listed addresses. The “dice” is then rolled and depending on the outcome, i.e. bigger or smaller lucky number than the one chosen by the player, the payout will be send to the same address. If the lucky number is smaller, the player wins and the bet amount is multiplied by the factor designated by the prize. If it is larger, the player loses and the bet is multiplied by 0.005 and sent to the appropriate Bitcoin address. Fairness is not an issue since the game itself is designed around the idea of a blockchain – the bet contains a unique code that is used to complete the roll, which is published the next day so players can make a comparison. SatoshiDice is all about placing bets so it is obvious that the game will be centered on providing overview and easy access of its betting options. The odds range from 97.6563% and down to 0.0015% for payouts going from x 1.004 and up to x 64,000. The house edge is set at 1.9% which is reasonable, though there are Bitcoin gaming sites that offer lower percentages. 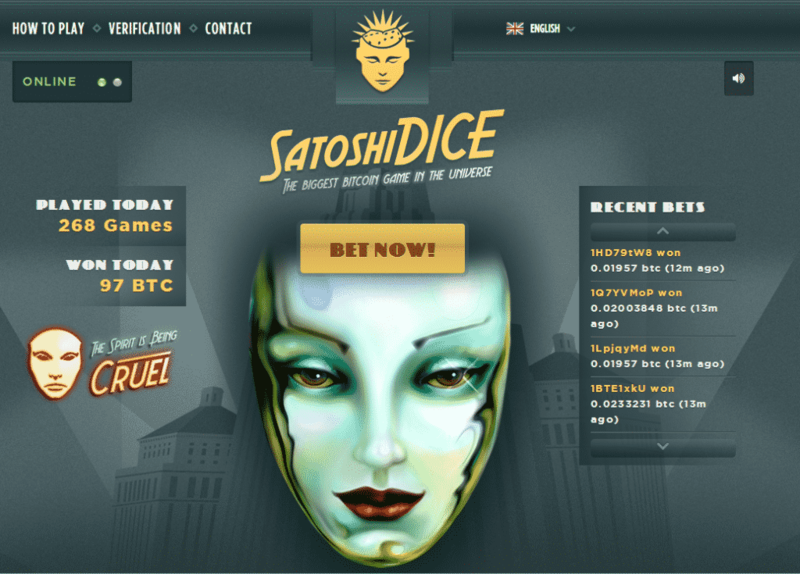 SatoshiDice gives the option for multiple bets in a single Bitcoin transaction. This is achieved by placing multiple outputs to the desired number of bet addresses listed on the site. Each bet has a different lucky number attached and will be evaluated and paid separately. Sometimes the software might cause delays in the evaluation and payout process. However, the game itself is designed to always calculate the outcome with the date of the bet placement attached, in order to avoid mismatch of lucky numbers and their appropriate odds. Delays can be avoided if the player includes the standard fee of 0.005 BTC in the payment transaction, which will help highlight the bet and be processed by the system faster. SatoshiDice uses secret keys that help determine the authenticity of the rolls and to avoid any possibility for rigging the game. These unique keys are decided upon ahead of time and aren’t revealed immediately. Instead a hash (hash key) of the key is released when the player places the bet. The secret keys are later revealed so players can compare them and decide for themselves that they were provably fair. Bets are placed automatically and approved within seconds if there is no delay on the SatoshiDice network. There is an option for redirecting funds to another Bitcoin address. It is done by making a transaction (bet) to SatoshiDice with a predetermined bet amount and a second transaction to a specified address, along with an amount of exactly 0.00543210 BTC. The payout for that particular bet will be stored at the other address. There is no live chat or phone support available at SatoshiDice, though you can contact the site representatives via their official email at support@satoshidice.com. You can also comment, ask for tips and discuss the latest updates and suggestions on the official Bitcoin forum. The ingenuity and simplicity of SatoshiDice cannot be denied – the provably fair system that is based 100% on luck and which offers equal chances for players to win is enticing indeed. Placing bets has never been easier, and the anonymity and direct payouts shouldn’t be underestimated as well.